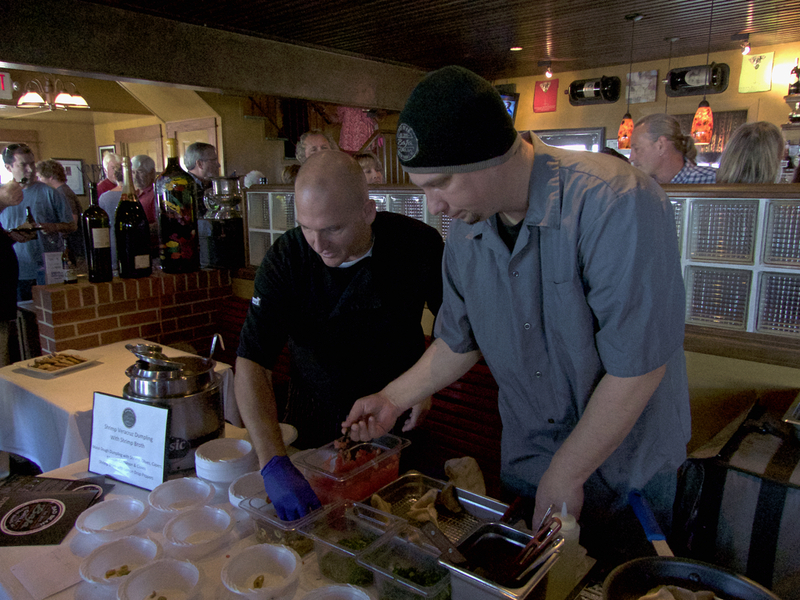 Rob Robinson in black and Matt Payne, chef’s for Bad Bean in Kitty Hawk, creating their Shrimp Veracruz. Bad Bean is just down the street from the Joe Lamb Jr., & Associates offices. It was certainly crowded in Ocean Boulevard for the 7th Annual Outer Banks Shrimp Cook Off. With 10 restaurant on hand and some great weather, there seemed to be a lot of folks sampling some great dishes. It’s nice, too, that the event is a fundraiser for the Outer Banks Center for Dolphin Research. It’s a local organization that works to keep track of local dolphins—their migratory patterns, populations and general health. This is the nonprofit’s eighth year of working in the field and they’re starting to get some good information about the local dolphin population. The Cook Off is for a good cause, but the reason for being at Ocean Boulevard was the shrimp. And what we sampled was spectacular. It’s almost impossible to pick out a favorite, because everything was excellent. Bad Bean had a Shrimp Veracruz Dumpling with Shrimp Broth. The dumpling used masa dough and it gave the dish a very different flavor and texture. Cafe Lachine created a marvelous puff pastry with shrimp in the middle of it. Light and fluffy, that was also very good. However, if pushed to make a decision, we’re going to go with the Pan Seared Shrimp over polenta with a smoked tomato sauce. Ocean Boulevard has hosted the Cook Off for the past seven years. Having ten restaurants on hand is the most that have participated yet and it really stretched the capacity of OB. Good thing we had beautiful weather because Two Road Tavern was outside, which worked with with their grilled shrimp stuffed with crab meat. There were also three restaurants upstairs, which is a bit cramped under the best of circumstances. It was though, a very nice event. The chefs seemed genuinely happy to be there and with good food and a good cause, the day seemed to be a genuine success.